Venezuela Says Recount Likely After Chavez Heir's Close Win : The Two-Way The initial vote count shows Nicolas Maduro with a scant edge over challenger Henrique Capriles. Maduro, who was Hugo Chavez's hand-picked successor, had been expected to win easily. 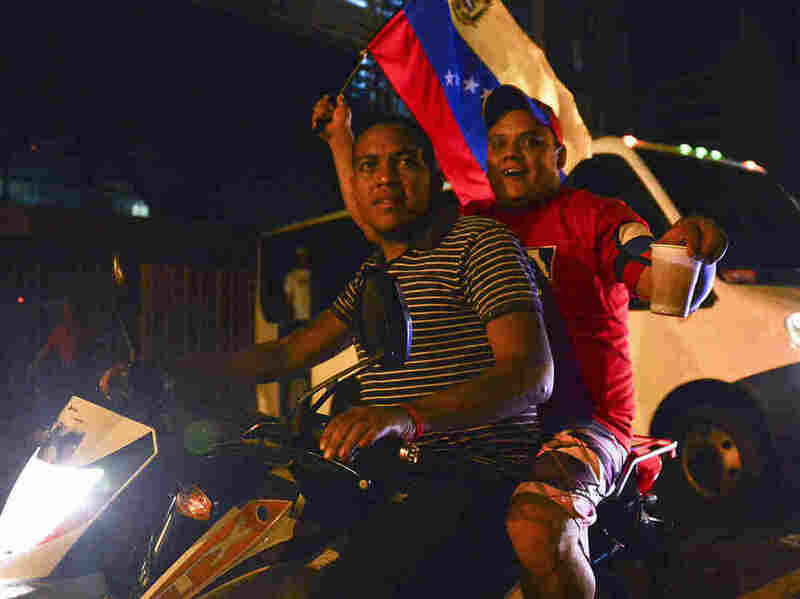 Supporters of acting President Nicolas Maduro celebrated Sunday night in Caracas, Venezuela, after the initial vote count showed him enjoying a narrow victory. A surprisingly small victory margin for Hugo Chavez's hand-picked successor in Sunday's special presidential election looks likely to be followed by a recount in Venezuela. Chavez, Venezuela's fiery, controversial and charismatic leader, died on March 5. NPR's Juan Forero tells our Newscast Desk that Nicolas Maduro, who had been Chavez's vice president, was expected to easily win the special election. "But instead," Juan reports, "he barely took 50 percent of the vote against Henrique Capriles, a 40-year-old lawyer and governor." Maduro had only about 235,000 more votes, Juan says. So Capriles has not conceded. He alleges there were at least 3,200 violations of electoral rules by the government. And he demanded that the votes be counted again. On Sunday evening, Juan reports, Maduro said the government would permit a recount — and that he was confident he had won the election. Reuters writes that "a protracted election dispute could cause instability in a deeply polarized nation with the world's largest oil reserves." The Wall Street Journal says a recount sets the stage "for rising tensions in this deeply divided nation, which holds the world's largest reserves of oil and is sliding toward economic crisis after 14 years of free-spending rule by the late populist." In the week leading up to the election, Juan and Morning Edition's Steve Inskeep reported from Venezuela for a special series about life there "after Chavez." There's more from Juan about Sunday's election on Monday's Morning Edition.